Departement of the Hautes Alpes - Population : 2,211 inh. - Altitude : 1,050 m.
On the N94, between Briançon (35km) and Gap (58km), take the D902A afterMont-Dauphin. 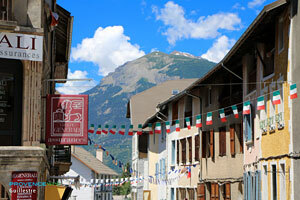 Guillestre is a large mountain village nestling in a green valley, near to both Natural parks (Écrins and Queyras). It breathes pure air from the nearby mountains. 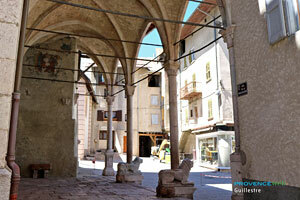 You might be surprised to learn that Guillestre is also a town of art and history. 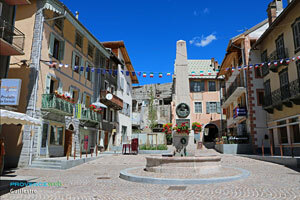 You might be surprised to learn that Guillestre is also a town of art and history. Go past its smart little square with a beautiful fountain in the middle made of Guillestre pink marble, where you will also find the tourist office, take Sainte Catherine street that begins under an archway and you will have some nice surprises, in addition to beautiful pastel-coloured façades, some superb buildings such as the former "Justice and Peace room" and door lintels dating from the 18th century. 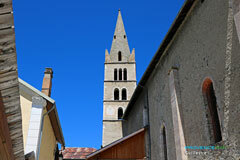 The imposing Notre-Dame d'Aquilon church is a listed historical monument. It was built in the 16th century in the Romanesque-Lombardic style, using the pink marble taken from local quarrites, by the Lombardic architect Galéas. It has an enormous gothic archway with pillars supported by lions, a sumptuous gateway and a Romanesque belltower with three stories. Right next door is the baroque chapel of Saint-Sébastien, with a beautifully restored façade, which will dazzle you with its trompe-l'oeil sculptures. 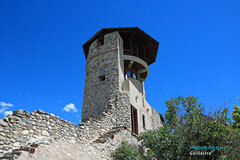 Further on, you'll admire the beautiful remants of the medieval fortifications, in particular the Eygliers watchtower, which still stands proudly. After culture, nature once again takes over. Head for the high peaks of the Ecrins natural park, descend the tumultuous Guil on a raft, or fly up into the air on a paraglider or a hang glider, using the warm updrafts ! St Guillaume chapel (11th century). 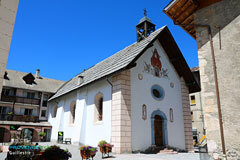 ND d'Aquilon church (16th century). The hot springs at Plan de Phazy. Mont Dauphin fort built by Vauban in 1692. At Eygliers: St Antoine church (15th century frescoes). 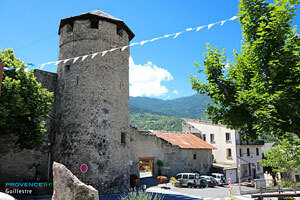 At Saint Clément sur Durance: the Lombardic Tower (14th century). At Réotier: the Petrifying Fountain. 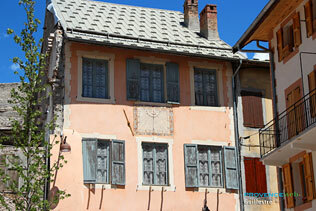 Plateau du Simoust with Rue des Mascs and its legends. Hiking (speaks at 3000 metres and many passes). Rafting and Kayak (on the Durance or the Guil rivers). Mont Dauphin (6km) and Château Queyras (18km).